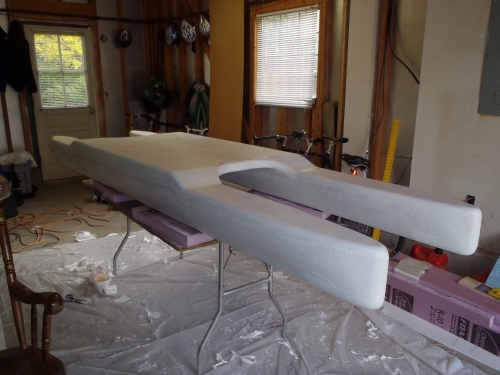 The laminate coat of the Standamaran SUP (click here for the full history) is pretty much done. 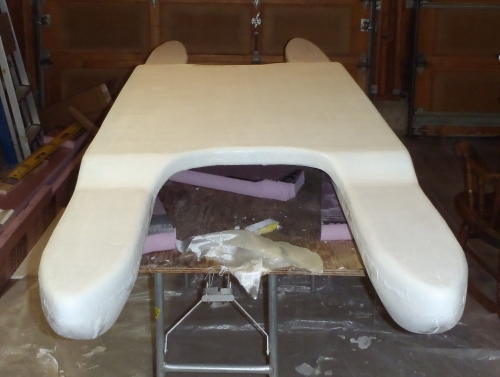 Laminate coat is surfboard jargon for the layer of figerglass and epoxy that is laid down over the shaped foam. 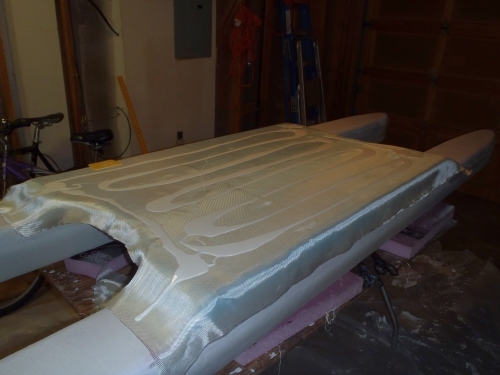 Traditionally, there are two more coats in surfboard building called a fill coat and gloss coat. 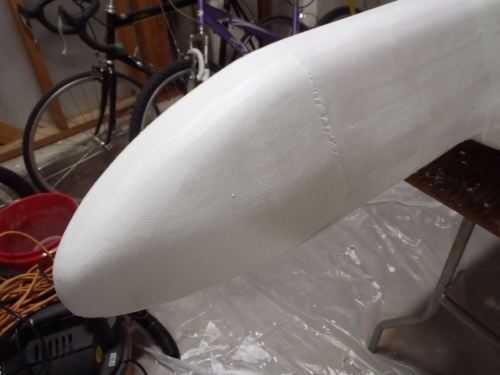 The fill coat is at least partially structural but the gloss coat is mainly aesthetic and appearances don't really matter all that much for a fishing vessel, so I am going to skip it to save weight and time. First I glassed the bottom of the platform with 38" wide 6 oz E glass. There is also a strip of 3" wide 8 oz fiberglass tape hidden in the radius between the platform and pontoons for re-inforcement. This was the first time I ever laid down any glass and it was a learning experience. It turned out that I shouldn't have tried to laminate up the sides of the pontoons at the same time as the platform. The section where the platform curves into the pontoons is really really hard to get the glass to lay down tight, particularly if you are pulling on it from two directions. A better option would have been to trim the glass to stop partway up the radius between the platform and pontoons and then overlap that with the laminate on the pontoons. Nevertheless it came out OK. Just OK, but I am cool with just OK if it doesn't fall apart the first time it gets within 10 feet of water. 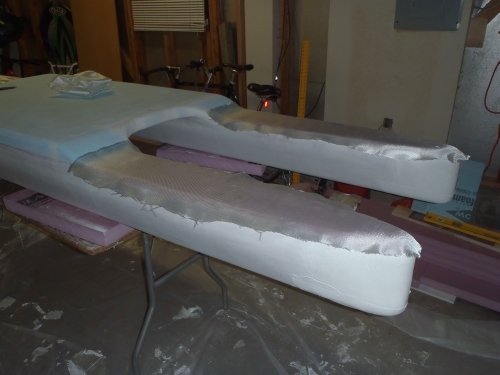 I am adding white pigment to the epoxy so that the final board doesn't heat up and de-laminate in the sun. OK, maybe appearances does count a little, because it is also so that I am not floating around my local carp lake on a pink boat. I got street cred to maintain after all. 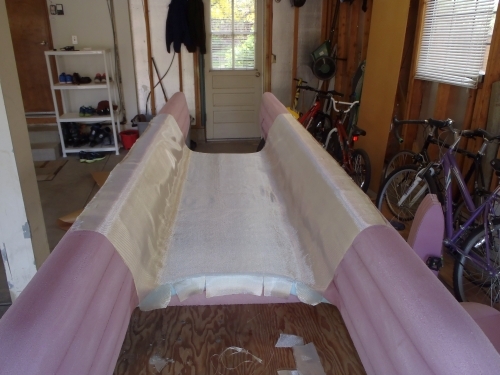 The next step was to laminate the bottom of the pontoons with a layer of 4oz under a layer of 6oz. The learning continued. The middle of the pontoons was hard enough since I was not glassing a flat horizontal surface. Trying to glass the middle of the pontoons at the same time as the complex curves at either end was just silly. I ended up using at least twice as much epoxy as I should have needed and also had to cut out quite a bit of jacked up glass out of both tips. After I cut out the bad glass I had to find some way to smooth things out if I was going to be able to cover the mistake with another layer of glass. After some research I used some DAP spackling to fill. I had some laying around that is pink until it dries, then it turns white. 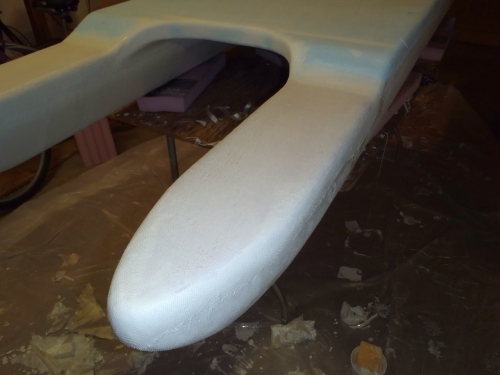 It is easy to shape and sand, but unfortunately it is not water-proof like the rest of the extruded polystyrene foam I am using so I am going to have to make extre sure that these sections are fully sealed. After filling and re-shaping I added a new layer of glass over the aft tips in two overlapping halves. That made it ALLOT easier to get the glass to flex to fit the rounded shape and it came out awesome. I wish I would have known what I know now the first time - it would have saved allot of work! 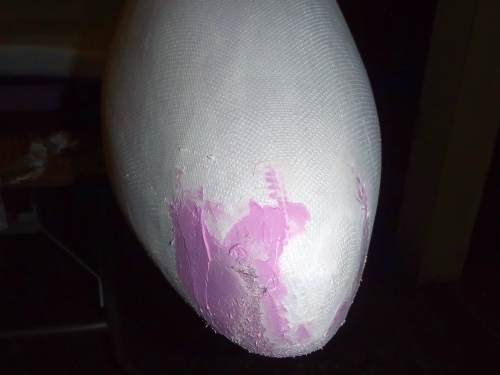 The repairs on the forward tip were similar in nature in that it involved several smaller overlapping pieces of fiberglass. After that it was time to glass the top. 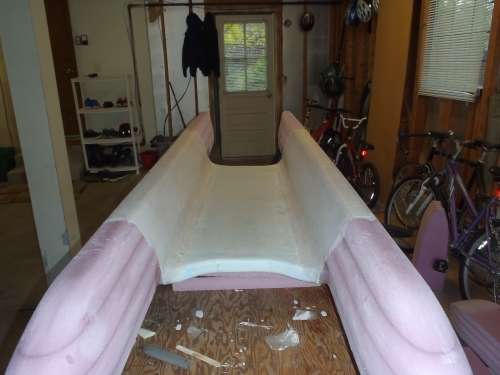 I started by sanding down all the "laps" (short for overlap I suspect) which is the edges of the existing layers of fiberglass. 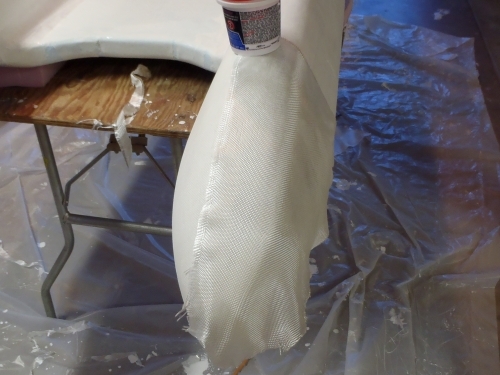 The fiberglass on the top section is going to overlap these edges and you have to feather them out so that the new glass lays down smoothly over them. While sanding I decided that I needed to clean up the front and back of the platform. When I glassed the bottom I did a pretty crummy job dealing with the curved nature of these "rails" and I wasn't going to be able to get the glass on the top to over-wrap it cleanly without some filler. A little more DAP spackling and it was good to go. 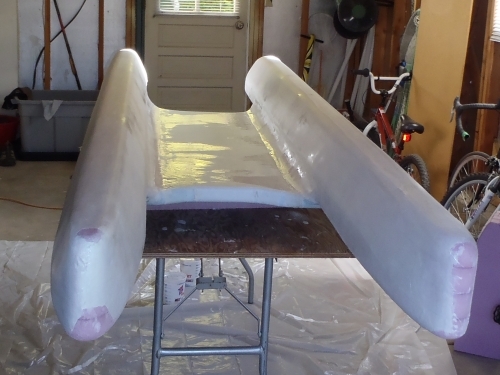 For the top laminate coat I started with one layer of 6oz on the front and back of the pontoons. By this time I was getting much much much better at this. 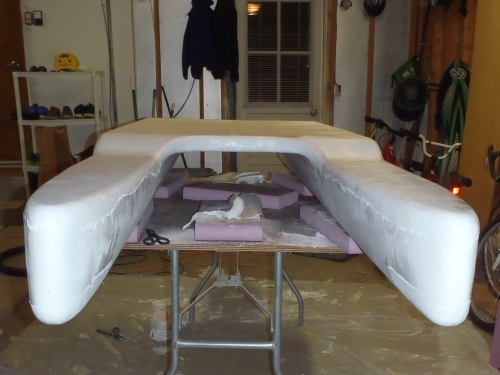 The top of the pontoons came out pretty good. Which is too say I didn't botch anything, didn't use twice as much epoxy as I needed and managed to lay down glass on the more complex curves at the tips without any major catastrophes. Next I laminated the top of the platform with a layer of 6oz glass over a layer of 4oz. This was my best showing of the whole laminate coat. It came out as close to perfect as a first time glasser can expect. At least I hope it did. For all I know the whole damn thing is going to blow up the first time I stand on it. Nah - just kidding. I am pretty damn sure it is going to work and work well. Add a couple of 3" fiberglass tape re-inforcements. Sand all the laps flat and sand out a couple of the more blatant blemishes. Clean up some small bubbles in the laminate I missed the first time. 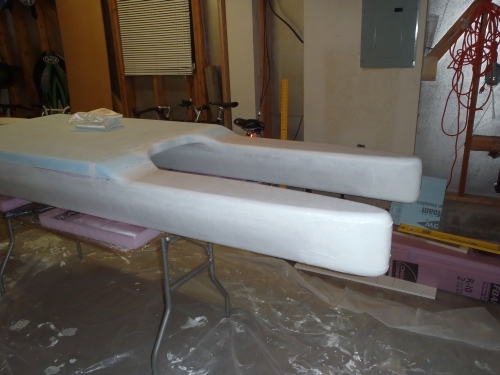 Add a thin fill coat of epoxy. Figure out what the heck I am going to do about a deck traction pad. Figure out what the heck I am going to do about a paddle, push pole, car rack etc. etc. etc. 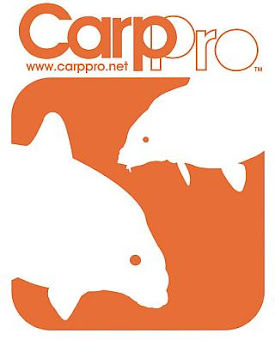 Figure out what (if anything) I am going to do to add a logo. At this point it weighs 23.5lb. 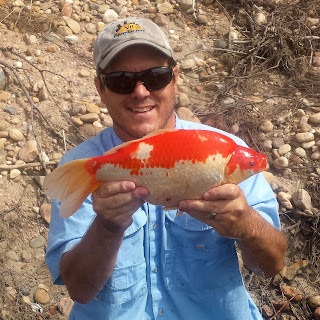 I was hoping to keep it under 26lb - I think I am going to pull it off! Well done man. Way beyond my skills. 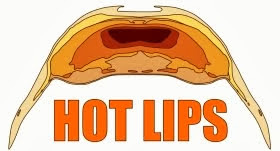 It's not that hard, but does probably require something slighly above average on the handiness scale. Way beyond my desire as well as skills, that was a lot of work, I commend you. Hope it floats and rides well! 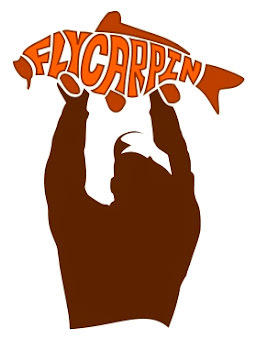 I think this would probaby work better for you than the aluminum jon boat your sons strapped your chair to last year. A little more stable and you would be a little higher off the water. 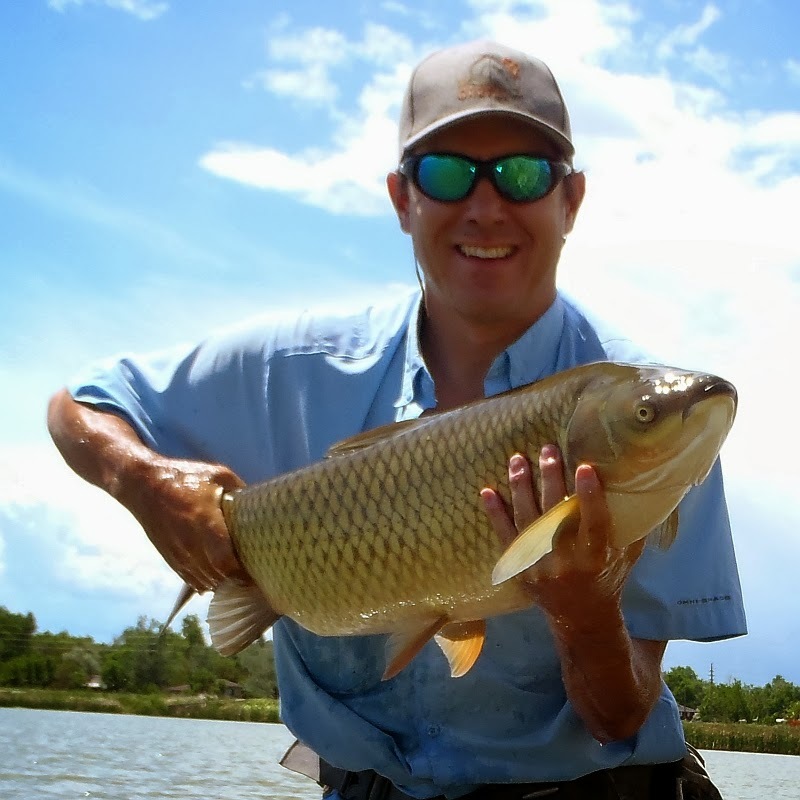 Also, I think you are probably much more attuned with how to deal with akward stuff like switching from the paddle to fly rod and back again than other folks. Standard operating procedure I would imagine.. I have tried to picture it a couple of times though, and the logistics of getting you and your chair onto the dang thing and strapped in baffle me. It would probably require a boat launch and some ingenuity. Of course, I have a hard time picturing many of the things you have to deal with on an hourly basis so maybe it would be easier than I can imagine. Oh those were V hulls of aluminum, ours with a 7 year old boy, who probably did not make it any noisier than it already was. Nice of you to think of me, I could transfer to that somehow. Getting into my kid's boat was from a dock and I had no choice but for them to lift the chair and I, much more help than I usually desire, but it was an adventure. Trust me, anyone could do what I do if they really wanted to. Like "I am Batman" badass. Except he only works in black. And sometimes very very dark grey. If you don't have kids I apologize for the lego movie reference. Definitely like what you've got going on here, impressive. Thanks Isaac. I will check that out. I was going to go with cork, but decided I didn't like the look of it. traction pad - skateboard grip tape should work. 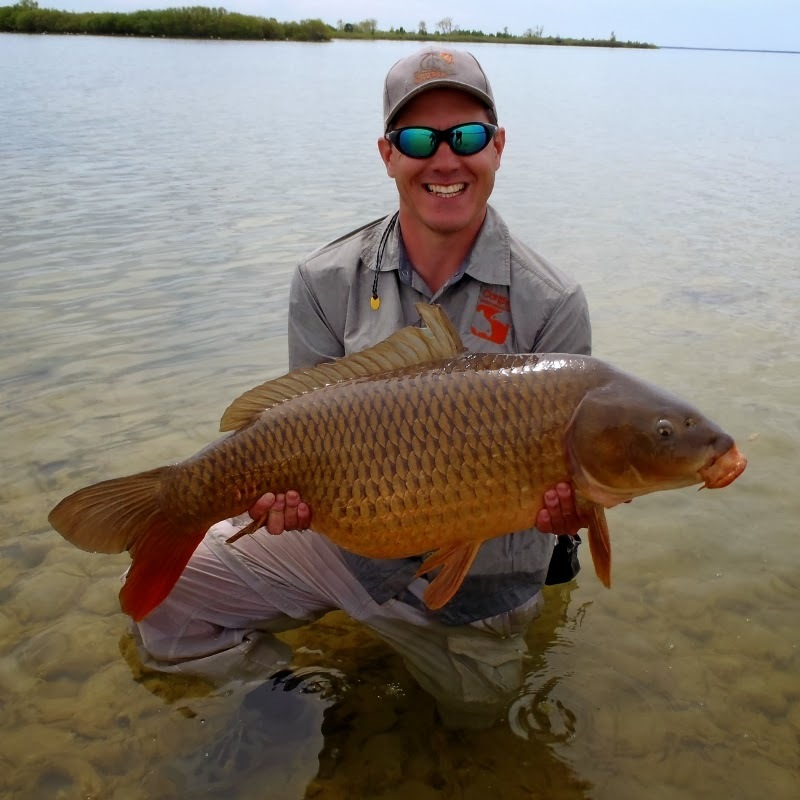 a SUP paddle is what I'd go for, trick will be to find a cheap one that you won't mind using as a push pole in a pinch (sorry for alliteration). Either leash the paddle so it can just be dropped when necessary, or install a soft foam paddle rest somewhere, so you can put the paddle down on the floatcraft without clonking..
nice work on the glass for first time.. 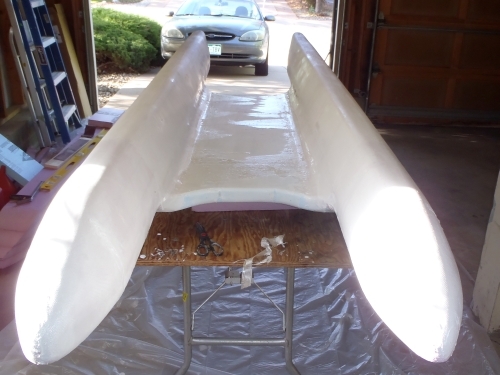 I've patched a few canoes in my time but never attempted those complex curve structures..
Yeah, and 3m has some stuff that is clear and just a little less abrasive than skateboard tape that I have been eye-balling. 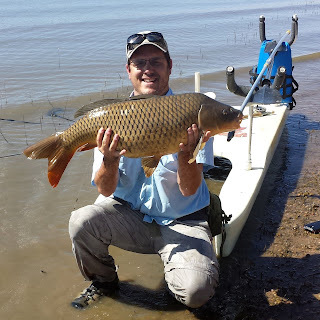 Thanks for the advice on paddle management. I think that is probably very very very good advice. 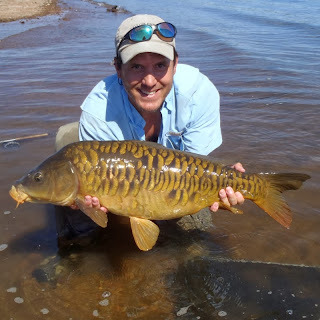 Hey man, looks pretty good for your first time glassing! 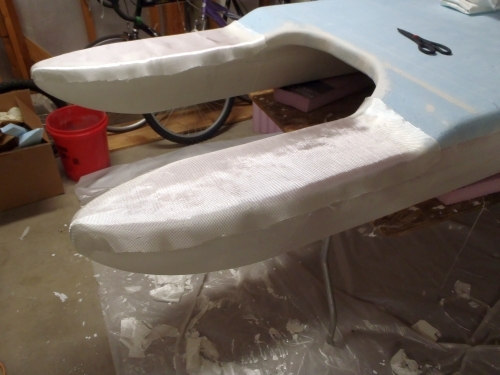 I used to shape surfboards once in a while when I lived in California. I just have a couple suggestions. I'm not sure how hard your foam is, but a 6+4oz glass job was common on shortboards (that don't usually last as long as longboards), and would always end up with a ton of dents from heel and toe pressure. The longboards typically get thicker glass jobs, like a 6+6 with an additional 6oz section where your feet are, 6+8, or 8+8, and wont dent or ding as easily. You are right about the gloss coat, you don't need it. 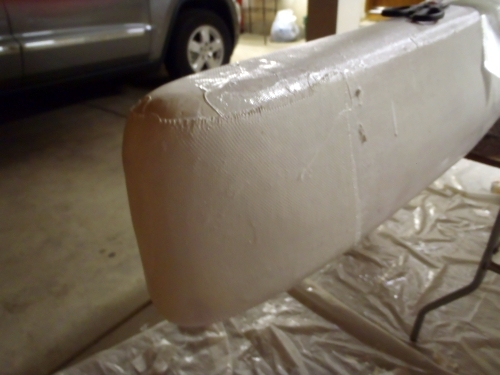 Be really careful when sanding not to get into the actual fiberglass, you only want to hit the top coat of resin. If you want graphics, we used to print onto rice paper in the inkjet and glass it in under your top coat. 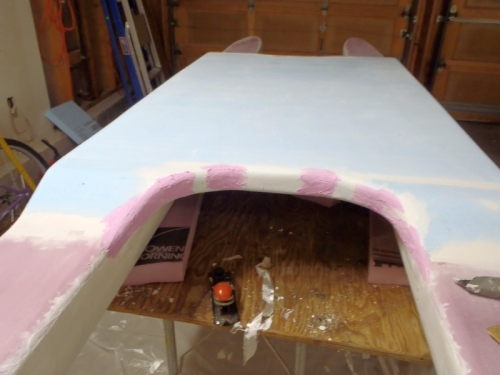 For deck traction see if you can find a textured deck pad made for SUP boards, it should have an adhesive back made for sticking to fiberglass. Good luck! Thanks allot for the extensive feedback!!!!!! Interesting on the glass schedule. I will actually always be using wading shoes so that I can hop off at any time. Not sure if that makes me more or less susceptible to heel dents!!! I have some more glass on it's way in the mail, I will consider adding another bit. Although if I add a traction pad it will provide some protection from point-loads. The SUP retail commercial traction pads are WAY to expensive.